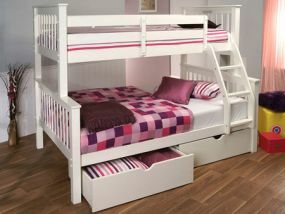 Installing bunk beds in your home is a sensible way to maximise all of the available space in a bedroom. Traditionally, however, bunk beds have tended to be a little on the no-frills side: economic on space but dull on aesthetics. That has all changed now, and Limelight is proud to offer bunk beds that boast all of the traditional elements as well as being pleasing on the eye. More children on the way? Limelight bunk beds are the way to go. Ideal for homes of ever-expanding families, the pavo bunks are available in a smart pine or white finish, while they further save on space with the added option of floor-level drawers. The pavo triple sleeper goes a step further by doing exactly what it says in the description – sleeping three people. Limelight's bunk beds are competitively priced and carry the added bonus of offering the buyer next-day delivery.